Experimenters With the Bicycle for the Army Reach Lincoln. “From Germantown [called Garland today] to Lincoln the roads were exceedingly bad and hilly the greater part of the way and were only good when within five miles of Lincoln. At West Lincoln the command was met by Major Fichet of the U.S. cavalry, acting on the governor’s staff, and who made arrangements for our camp on the statehouse grounds. The procession headed by Major Fichet and followed by the corps, passed through the city and reached the state house grounds by 9:30, where a temporary camp was made, it being the intention to leave Lincoln that same evening. Before the corps had been in camp 20 minutes the grounds were covered with interested sightseers, and it was almost impossible for the men to get around on regular routine duty. At 5 o’clock assembly was sounded and the corps formed into line in the street and started out of the city on their way to Table Rock, which was reached a day later. The detachment of bicycle soldiers from the Twenty-fifth infantry, who are making the trip from Ft. Missoula, Mont., to St. Louis to test the efficiency of the bicycle for making long trips successfully, arrived in Lincoln at 9:30 a.m. today. They camped at Germantown last night, leaving there at 5:10 this morning. They were met at Germantown by Major Fechet, who accompanied them to the city. They will leave at 4:30 this afternoon for St. Joe. They left Fort Missoula on the 14th of June, and have had a pleasant time, although all admit to being pretty tired. The experiment has so far convinced the commandant, Lieut. Moss, that the bicycle has a future in the army. They are encamped on the capitol grounds. They carry with them tents, poles and other paraphernalia used by cavalrymen on march. There are representatives of Companies A, B, F and G of the Twenty-fifth Infantry. Lieut. Moss being of Company G. The men carry extra tires and rims, and each man rides a different make of wheel. Quite a crowd watched the men start last evening and several cameras were there to be leveled at the file, but the sun was obdurate and refused to shine. The route to be taken includes Roca, Hickman, Firth, Adams, Table Rock and Rulo. At the latter point the corps will cross the Missouri river. They will follow along the north bank of the Missouri river as closely as possible until they reach St. Louis. Firth. The United States colored troops of the Twenty-fifth regiment came into town [Firth] Wednesday evening about 8 o’clock and camped on the south side of town. They were on bicycles and came from Mt. [sic] Missoula, Mont., on their way to St. Louis, under command of Lieutenant Moss. 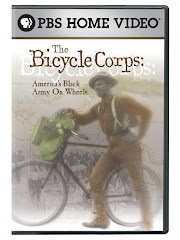 The trip is an experiment, demonstrating the feasibility of using bicycles in the service of moving troops. 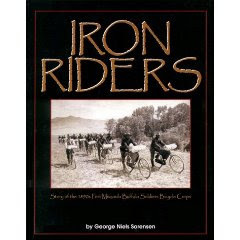 In the eastern part of Montana they were caught in a snow storm, and had to walk and carry their bicycles and trappings, weighing 118 pounds, for a number of miles. While passing through the sand hills in the western part of the state they had the same experience, being able to ride only eighteen miles out of 100. They left town at 6 o’clock Thursday morning, following the B. & M. track. "The 22 soldiers and one reporter who started from Fort Missoula, in Montana, west of the Rocky Mountain range, on June 14, passed through Adams yesterday morning, July 15, on their way to St. Louis... On Wednesday evening [they]...camped at Firth"